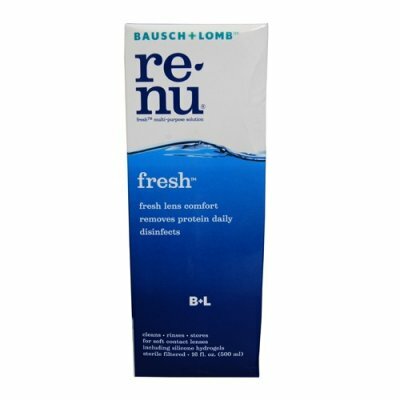 renu fresh multi-purpose solution rejuvenates your contact lenses, making it feel like you are putting in a fresh pair every day. renu fresh multi-purpose solution is proven to fight germs, clean lenses, and remove irritating protein deposits daily from your soft contact lenses for that fresh lens feeling every day. Daily use of renu fresh multi-purpose solution eliminates the need for a separate enzymatic cleaner or daily cleaner for many lens wearers. If you have optical cover with your health fund you will be able to claim a rebate when you purchase contact lenses from us. We provide an itemised tax invoice detailing all the required information to obtain your rebate. Orders are dispatched within 24 business hours so please allow 2-4 days for delivery. However there may be an exception for some toric and bifocal prescription lenses which we do not keep in stock and if there is a delay of more than 4 days you will be advised by email. We endeavour to make ordering contact lenses online easy and all our orders are backed with a manufacturers quality guarantee. If you are dissatisfied with your order we will make it right. Should your prescription change we are happy to exchange unopened boxes of contact lenses. You cannot use a spectacle prescription to buy contact lenses. Contact lenses are not all created equal, they are made using different materials and designs which result in a different fit on the eyeball, so it is VERY important to order the exact lenses you have a prescription for. Prescription information can be found on your contact lens box and blister packaging. You can also obtain a copy of your prescription from your optometrist or eye dr. If you need help with this simply add a note in the comment section of your order during checkout.